Update: we have found the beblu delivers better performance when Rollup 2 for Media Center is installed. See our news article here. 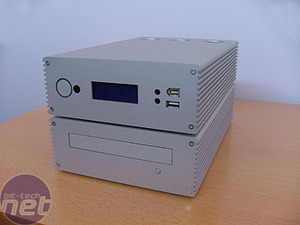 Media Center PCs are all the rage these days. A couple of weeks ago, we published an article on some of the hardware considerations you should think about when building a Media Center PC. With all the caveats and confusion, it's no surprise that many people choose to buy an off-the-shelf system. Enter beblu: stage right. A new, British company, they've come up with an innovative new form factor for the home theatre box. Taking inspiration from the mini HiFi systems that have been so popular with consumers over the last decade, the beblu system comprises of a number of different components that are stacked together. The end result is aesthetically pleasing, but does beblu have what it takes to build a worthy Media Center system? That's what we're here to find out. We have the basic system in for testing today. 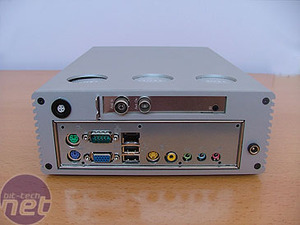 It comprises a VIA Mini-ITX mainboard with 512MB memory and integrated graphics as its base platform, along with a DVD player housed in the second box. 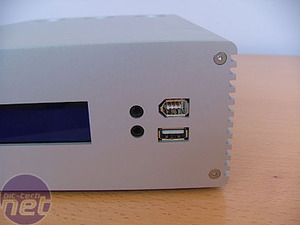 Over the coming months, beblu will be introducing Pentium M systems to complement the VIA line, as well as additional components - these will include a backup hard drive, card readers, a power and USB hub amongst others. 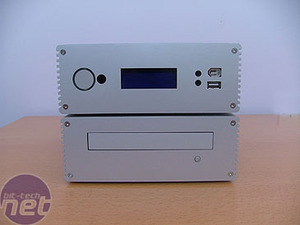 This machine is designed to be quiet, look good, and offer at least most of the functionality of an ATX Media Center PC. It can be stacked with the components horizontal, or the components can sit side by side for a more low profile configuration. As more components are added, you could obviously build up a 1x4 vertical system, or a 2x2 tiled system, or however you fancied. You can play with the options - LCD v no LCD, RAM configurations etc - if you head over to the product page on the beblu site.